A skin graft is a patch of skin that is removed by surgery from one area of the body and transplanted, or attached to another area. 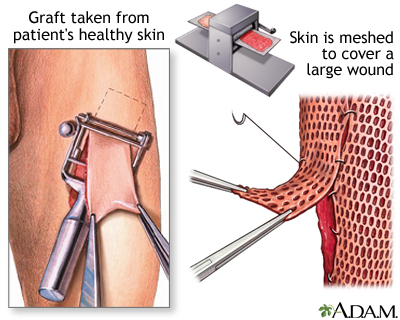 The skin patch might be taken from another individual also which is then called allogenic graft. Grafting helps to reduce the course of treatment needed (and time in the hospital), and also improve the function and appearance of the area of your body which receives the skin graft. Skin grafting is done under general anaesthesia where you will be unconscious and so you cannot feel the pain. 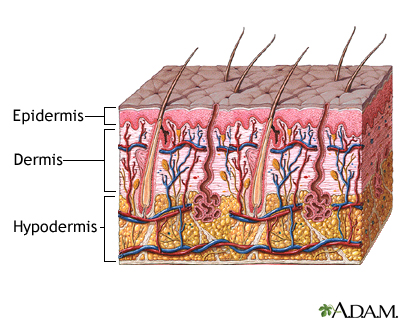 Skin is taken from a healthy site in your body called the donor site. 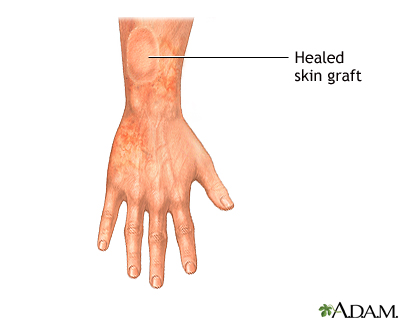 There are 2 types of skin grafts-split skin and full thickness grafts. In split skin grafts the upper two layers of the skin (epidermis and dermis) are taken and in full thickness grafts all the layers of the skin along with muscles and blood vessels are taken. Donor site for split thickness skin graft: buttock or inner thigh. Fig 2: Illustration of donor sites. The graft is carefully spread on the bare area and held in place either by gentle pressure from a well-padded dressing that covers it, or by staples or a few small stitches. The donor-site area is covered with a sterile dressing for 7-10 days. The type of graft you require depends on the indication for which you are undergoing this procedure. This will be decided by your doctor. If you have undergone a full thickness graft, you may have to stay in the hospital for 1-2 weeks. Full-thickness grafts are done when a lot of tissue is lost. Eg. Open fractures of the lower leg, or after severe infections. You will have to protect the skin graft from trauma, such as being hit, or heavy stretching for at least 2 to 3 weeks. 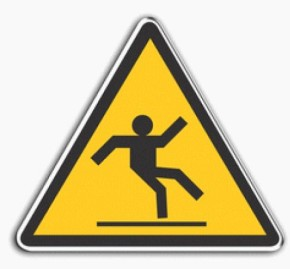 Be careful while walking, avoid any trip or fall. Keep the graft site above the level of your heart when sitting or lying down. This helps reduce swelling and fluid buildup in the graft area. Skin graft site should not be soaked in water for long time. So you can use a plastic bag or plastic wrap to cover the skin graft for 1-2 weeks. The skin graft area needs some lubrication for 2-3 months as it no longer contains sweat/oil glands. This can be done using mineral oil or bland oil. This help to prevent drying and cracking. You will have to wear a dressing for 1-2 weeks after the procedure. Light bleeding, swelling, bruising, redness, and discomfort are expected. Fluid may leak from the donor site. 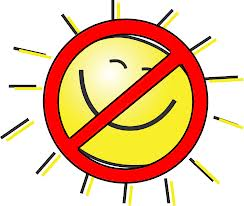 This will reduce on its own after few days. After 7-10 days once the dressing of the donor site is removed, the skin will be pink in colour. Gradually it turns to normal colour. 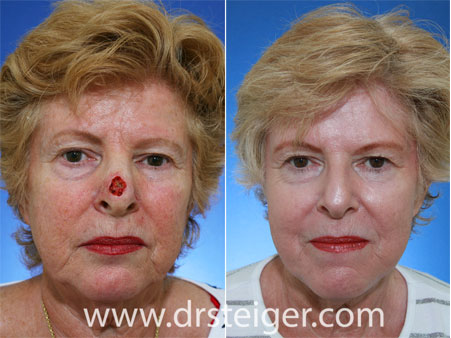 The skin may look crusted and discoloured after the bandage is removed which is normal. The colour will change over time. But be careful not to pick over the crusts as it protects and helps in healing. If the donor site becomes swollen, hot or painful. Avoid stretch exercises or other movements which move the graft from its place for 3 to 4 weeks. If you are a smoker, make sure you stop smoking. 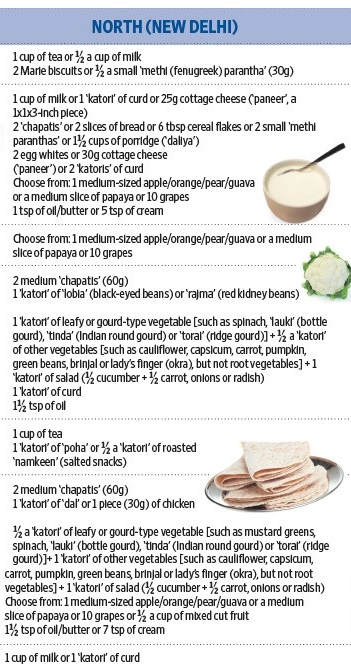 The healing of the graft depends on your nutrition status. 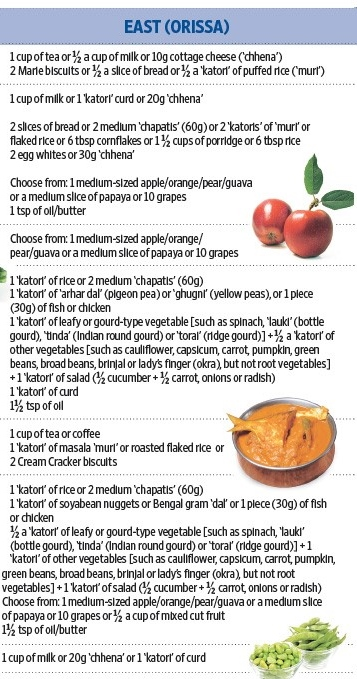 Hence an adequate balanced diet is important for speedy recovery. 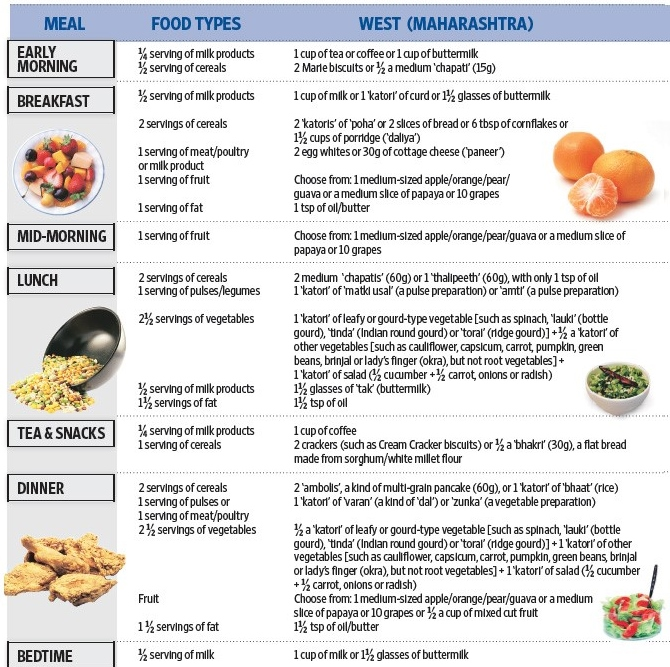 A dietician can help you guide a balanced diet. 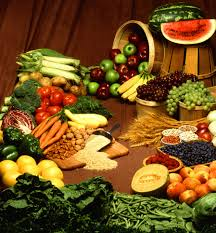 For further details on balanced diet you can follow the link below.